The official response to the State of the Union is typically given by a young, rising lawmaker with star potential. Following two of former President Barack Obama’s addresses to Congress, for example, Republicans chose then-South Carolina governor Nikki Haley, who is now the U.S. Ambassador to the United Nations, as well as Florida Sen. Marco Rubio, who ran for president three years later. But the choice also symbolizes the opposition party’s vision for its future, and ability to respond to the president’s primetime speech with a single coherent message. This year, Rep. Joe Kennedy III, D-Mass., is the Democratic Party’s pick to give the official State of the Union response. While the 37-year-old is part of the younger demographic Democrats hope to win over before the midterms later this year, not to mention part of one of the country’s most famous political families, he’s also seen as more moderate than many of the party’s more progressive candidates. He’ll also have to compete with four other unofficial responses from other Democrats, which has some on the left worried the party still hasn’t developed a unifying message more than one year after losing the 2016 presidential election. Picking the scion of a political dynasty demonstrates the party’s “disinterest in the mood of their own grassroots base,” said Maria Svart, the national director of the group Democratic Socialists of America. Kennedy, the 37-year-old grandson of Robert F. Kennedy, will deliver the party’s official response from the auto body shop of a vocational school in Fall River, Massachusetts. The number of Democratic responses has some worried the party still hasn’t developed a unifying message after losing the 2016 presidential election. Others on the left will likely tune into the unofficial response given by 2016 hopeful Sen. Bernie Sanders, I-VT., which will air after Kennedy’s speech on his social media channels. Sanders’ speech has further fueled speculation of a possible 2020 presidential bid, but it’s not the first time the Vermont senator has gone rogue by delivering an unofficial response to a president’s address to Congress; Sanders did the same thing last year when Trump spoke before Congress shortly after his inauguration. As if the Kennedy, Guzman and Sanders responses aren’t enough, former Democratic Maryland Rep. Donna Edwards will also speak on behalf of the Working Families Party. Edwards said in a tweet Monday that she wasn’t trying to create a rift on the left. The different Democratic responses have the “same message, different voices, all calling out this President and his dangerous, destructive, and divisive agenda. More power to progressive voices mobilizing for the fight ahead,” Edwards said. For its part, the Democratic Congressional Campaign Committee — the House Democrats’ campaign arm — is betting that Kennedy is the right choice. 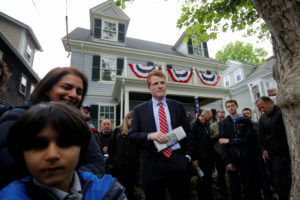 “Congressman Kennedy is an inspiring leader who has a unique ability to break down complex policy issues and connect with our hearts and souls,” Luján said.